My nephew's birthday is coming up and I made him a box card. I'm pretty sure he doesn't read my blog so I'm safe in posting this before his birthday. I was inspired by Jessica Wilson at CraftinandStampin to make this card and used the measurements provided by French Martin to make my own base since I am using an Expression 2 and can't use the SVG that Jessica had. I had already decided to use balloons in mine after seeing Jessica's video so I was really surprised that Frenchie's video was made with balloons! She saved me a lot of time in figuring out how to make the balloons look like they were floating. It was lots of fun to make and I hope he likes it! Being a young boy I think the gift card will probably make a bigger splash with him but I'm sure my sister will think the card is awesome. I had lots of fun making it. You can check out Jessica and French's videos linked above for detailed instructions on putting the box together but here are my basic measurements and materials used. Box card stock - basic white card stock cut at 9" x 5 1/2" - score on long side at 2 1/8", 4 1/4", 6 3/8", and 8 1/2". Then you turn the card to the short side and score at 2 3/4". You will want to refer to one of the videos above for the cutting instructions - it's not hard but I think it's easier to understand by seeing it. All my solid card stock is Core'dinations and the patterned paper all comes from an American Crafts Hip Hip Hooray pad I picked up at Tuesday Morning. The stamps were all from the Fiskars Happy Birthday set. All the die cuts (except for the circle punches) were from my Create-a-Critter Cricut cartridge. 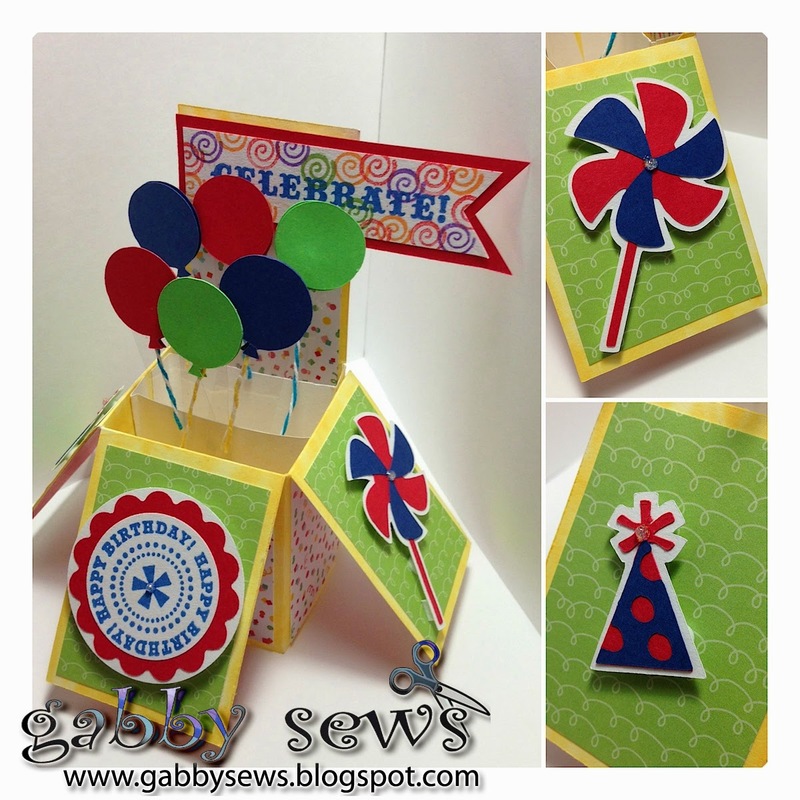 I cut the party hat and pinwheel at 2.5" and the balloons at 1". I used some scrap plastic that came off one of my stamp sets to adhere the balloons to the box. The circle punches are some basic Fiskars punches. The celebrate banner was hand cut. I used a lot of different inks to get the look I was going for. The base of the box is actually white card stock that I inked all over with some Stampabilities Yellow Pigment Ink. I really wanted a light yellow for the box but I just didn't have the right color in my stash. For the other stamping I used Momento Dew Drop in Bamboo Leaves, Danube Blue, Grape Jelly, and Tangelo. The red ink is Tim Holtz Distress Ink in Barn Door. I added some Diamond Stickles to the center of the pinwheel, the top of the party hat, and in the center of the birthday medallion. It was still wet when I was taking pictures so I couldn't show you that it folds up all nice and flat so it will fit perfectly in an A2 sized envelope. I used glue dots to hold my balloons together, pop dots on all the die cut elements, Aleene's Quick Dry for the box construction, and ATG to adhere all the pattern papers. I'm a little concerned that I might have added so much dimension that it will cost a little extra postage. I'm mailing it tomorrow so I'll make sure and check it out with the mail clerk.